Severe Storms and Tornadoes Affect South and Midwest | The Voss Law Firm, P.C. ?How can I get help if payment on a tornado insurance claim has been delayed? 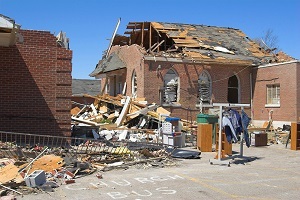 ?What can I do if the insurance company says I’ve misunderstood my tornado insurance coverage? ?How long do I have to submit a tornado insurance claim for my business? Although tornadoes can form any time of year, the months of April, May, and June typically mark the peak of tornado season in the Mid-South and Midwest states. Unfortunately, this year’s peak season has proven to be active. On Saturday, April 29, 2017, severe storms moved over several U.S. states, leaving a tragic wake of death, injuries, and property destruction. Attorney Bill Voss offers more details on the recent storms here, as well as information about disaster resources and how to get help with related insurance claims. Texas. A series of tornadoes hit East Texas, taking the lives of four people. The National Weather Service confirmed evidence of four tornadoes in the region, with a large tornado causing destruction in Canton, Texas. Emergency responders were still searching for trapped survivors on Sunday. Arkansas. A woman was killed when high winds blew a tree into her home. Flooding and heavy rains were also a problem in the state, and volunteer fire department chief was killed while checking water levels near Quitman. At least four other people also lost their lives in the storm. Missouri. Flash flooding and high waters affected many people in Missouri. Several drowning deaths were reported, and at least one person was killed when her car was swept away in flood waters. Several other states, including Florida, Louisiana, Alabama, Georgia, Tennessee, and Mississippi also saw severe weather or were under storm or tornado warnings as the system continued to move across the South and Midwest. If you have been affected by the recent severe weather and need assistance, we have put together a list of disaster relief contacts and resources that can help you get back on your feet. If you have questions about filing your insurance claims or fighting insurance claim denials, you can also contact the Voss Law Firm directly for a free review of your concerns. Our attorneys have extensive experience helping policyholders with difficult insurance claims, including large-loss business claims, and we would be happy to answer your questions today.